IRELAND . .Caravan . 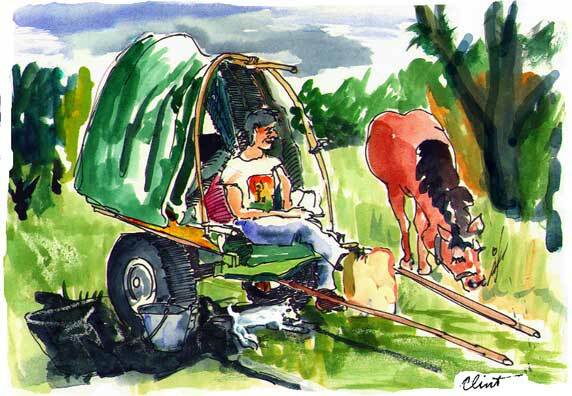 .He travels even slower than I. Seamus, 19, is with his dog in this creaky horse-drawn caravan, is delighted with the Irish countryside. He left his father's farm at Killmore Quay four days ago, on holiday after harvesting potatos. He says "Aye worked off me arse pickin' the 'tatties, an' now I'm clearin' out." We share lunch-my tuna fish, his bread. He spins tales of his farm life, Irish Catholic religion, the urgencies of youth. On his recent first trip to London, he met a French girl, who is coming in two weeks to visit. He intends to marry her, . . if his father agrees, . . .if she agrees, . . . .if he decides to ask her.